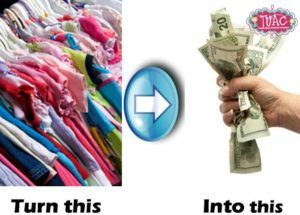 Let TUAC Help You Quickly Turn Your Children's Items Into Cash! TUAC Consignors Make An Average Of $310 in a Weekend! You may have tried consignment stores, buy/sale/trade groups, or posting your items on your own page, only to sell a few items and spend time trying to co-ordinate schedules for item pick up. TUAC offers you a way to clear the clutter all in one weekend with a BIG Check, Less frustration, AND an opportunity to shop TUAC early! And we’ve got your back thru the entire process! I want to join before spots are gone! I love the TUAC Consignment sale because I make money to pay for the clothes I buy at the sale. It is a win, win situation! I love TUAC because it just makes sense for Moms to shop this way. I love the ease of consigning and the appreciation for volunteers. I love the Facebook updates and shares as well! What kinds of things can I sell? Clothing, toys, baby equipment, outdoor toys, games, books, shoes, sporting equipment, and anything that relates to kids! Does it matter what season the clothes are? When can I drop my items? Do my clothes have to be on hangers? We are happy to help you thru the entire process. If you run into a question just shoot Shanna an email (shanna@tuackidssale.com) or message us on Facebook! We can walk you thru any steps or help with pricing and more!